Frankly, My Dear: I'm Doing a Classic Film Survey! I'm Doing a Classic Film Survey! First I'd like to apologize for missing the movie review on Sunday. It was a really crazy day and I couldn't get around to the computer. To that note, it's been a pretty wild week. But that's not going to stop me from getting this survey started! I originally thought about doing this back in December, when I reached 50 followers. In the busyness of the holiday season it was hard to do, and so I set the date for mid-January, but, thanks to an overload of schoolwork, I couldn't do it then either. I had the survey written out and the banners and everything, but it just didn't seem like the right time to host my first blog event. So we're doing it now! Kicking off February with a start! This is the month I was born in, so what better time for me to host a survey? Lol. I have seen this type of a thing turn out really well for some blogs, so I'm crossing my fingers it'll work out nicely for my blog, too. :) It's 15 questions long and I worked hard to try to be as original as I could with the questions since surveys and movie memes have been done so many times before. I made a banner for it - with Lucy, of course. If you're interested in doing this survey, please, by all means, answer the questions at your blog! That's the purpose, I really hope you all will participate because I'd love to see your answers! And if you do, be sure and leave me a comment with the link. :) Also, if you don't have a blog, or would rather not post the answers there, feel free to leave me your answers in the comments below. That's about it! You're free to reply to this survey pretty much whenever! If any of the questions seem confusing, I've answered them myself below so you can see how they work. At the bottom I'll post a list of the questions without my answers so they can easily be copied and pasted. I hope you all enjoy this and a bazillion thanks to anyone who may choose to participate :) This is my first blog event, like I said, so I'm nervous and excited and can't believe I'm finally, you know, doing this - all at the same time. But I'm keeping my fingers crossed for a good turnout! I'll go with Cinderella (1950). If I ever take "Which Disney Princess are you?" quizzes (lol, don't laugh) I get Cinderella each time, though I definitely don't look all that much like her! I love the movie, and I love the music - A Dream is a Wish Your Heart Makes and So This is Love. This movie just makes me happy, and I adore it. I know, terribly mean question. I had to think it over myself for a little bit. But I'm coming up with Irene Bullock from My Man Godfrey (1936). I mean, she says stuff like, "GODFREY LOVES ME - GODFREY PUT ME IN THE SHOWER - GODFREY LOVES ME!" Who could ask for anything more? Well, yeah, I hope this makes sense. Basically your favorite pair of classic Hollywood actors that were really good friends in real life - like I said above, Jimmy and Henry, Joan and Barbara, are examples. I choose Olivia de Havilland and Bette Davis. They made a few movies together and Livvie stepped in when Joan bailed out of Hush, Hush, Sweet Charlotte (1968). They got along really well in real life, and as much as I love Bette, I can imagine she was probably a personality that wasn't always easy to get along with, but these two did! 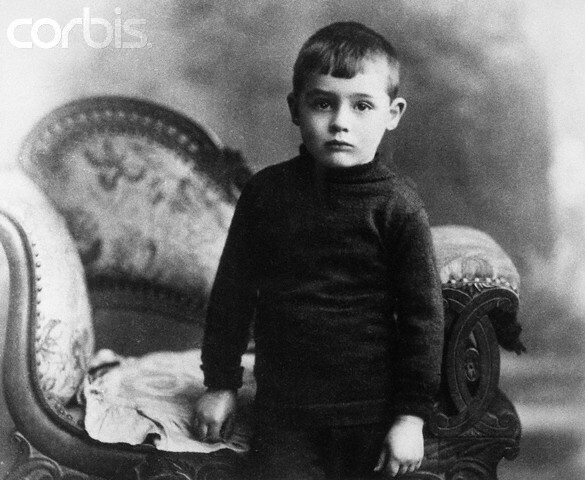 Clark Gable. Though he looked just as handsome without the mustache, perhaps sometimes more so, the mustache is just a part of Clark. 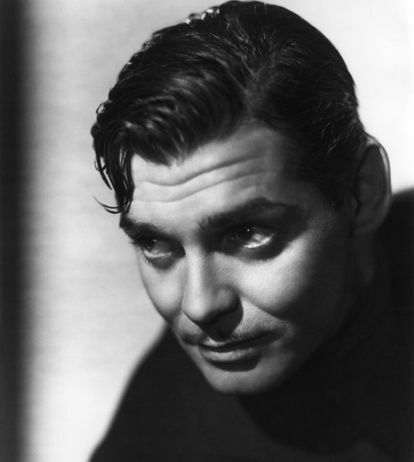 What would Rhett Butler ever be without it? So the platinum blonde image of Marilyn Monroe is pretty much the posterchild for Classic Hollywood - though Jean Harlow did it first, as I like to remind everyone - but there were several other actresses that rocked blonde locks! My problem with answering my own question is: was Ingrid Bergman truly blonde? 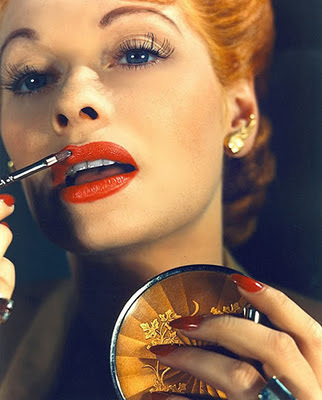 I would think that at least when she was young and doing pictures in the 40's, it was a dark, dirty blonde shade. (Because it photographed kind of dark in black and white). Later on, when you see her in color in movies like Cactus Flower (1968) and Autumn Sonata (1978), it's completely brown however. I know that people with a blonde/brown hair oftentimes find their shade of hair changing over the years, so perhaps is the case with Ingrid. I'm asking this question for my own benefit! Like I said, one of my film goals this year was to watch more pre-codes as I've barely seen any! So I'm hoping you all would be able to mention some great pre-codes for this question! As of, I'll go with It Happened One Night (1934), which isn't startlingly pre-code but, of course, a fantastic movie. This is kind of like how Harry Potter fans sort themselves into houses. -;) Classic Hollywood is famous, sometimes infamous, for it's studio system, with each studio having its distinctive qualities. You have several choices, like MGM, Warner Brothers, RKO, etc., just don't put yourself into Monogram!! 12. Lucille Ball, Audrey Hepburn, Katharine Hepburn, Natalie Wood, Grace Kelly, Ingrid Bergman, and Greer Garson - which one do you like the best? But, she is, of course, mine. 13. Shadowy film noir from the 1940's or splashy colorful musicals from the 1950's? I'm just getting into film noir (another film watching goal of this year), but I love it a lot. However, since I'm still wetting my feet in it, I'll go with the latter. Because also Singin in the Rain (1952) was really one of the films that drew me into my classic Hollywood obsession, and will forever be one of my favorites. 14. Actor or actress with the best autograph (photo preferred)? This is in kind of a slight reference to What's my Line?. Whenever an actor or actress "signs" themselves in on the slate, I'm always entirely inquisitive about their autograph. It's usually pretty amazing. My favorite, of course, will be Lucy's. Our handwriting is actually quite similar, a fact I really revel in. Her gorgeous signature on the bank card of hers that I own. 15. 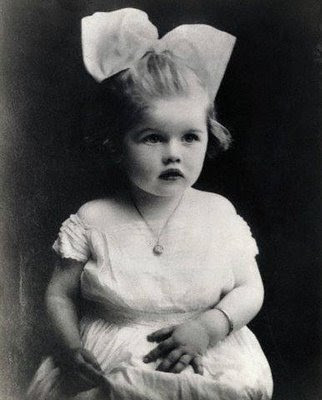 A baby (or childhood or teenage) photo of either your favorite actress or actor (or both, if you'd like)? Probably "Alice In Wonderland"; it's so delightfully surreal. So many good movies that year, but think I'll go with "Stagecoach," if not the greatest western ever made, certainly among the most pivotal. Carole's my all-time favorite actress, and choosing one is like selecting your favorite child. But I think I'll throw a bit of a curve here and select Ann Smith from "Mr. & Mrs. Smith," for not only is it a fun role, but Hitchcock photographs Lombard with incredible luminosity. Lombard and William Powell. It may have ended in divorce, but their relationship remained strong. They apparently had the maturity to realize they made better friends than lovers. Lombard had so many friends in the film community, but I'll make this a tie between two pals of hers: Jean Harlow (they only knew each other for about two years before Jean's death, but they were quite simpatico) and Lucille Ball (who came to know Carole at RKO and always credited her as a comedic influence). Hate saying this on the anniversary of Gable's birth, but it's got to be Bill Powell. There are so many I love, but I think I'll go with "The Smiling Lieutenant" (1931), some saucy Lubitsch. Jazz up your lingerie! Paramount, circa 1930. Perhaps the most sophisticated of studios. 10. Favorite common on-screen pairing that SHOULD have gotten married? 11. 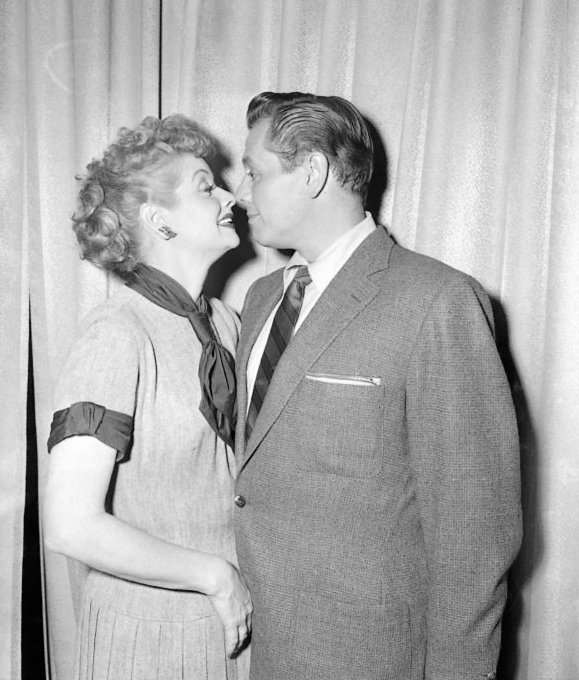 Favorite "I Love Lucy" episode? 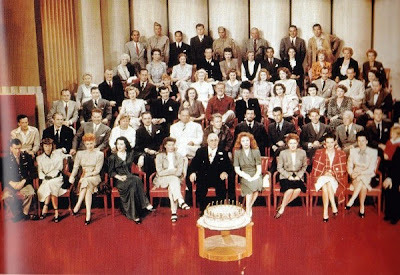 The one at the Brown Derby, as Lucy goes Hollywood. 12. Out of these actresses which one do you like best: Lucille Ball, Ingrid Bergman, Natalie Wood, Grace Kelly, Audrey Hepburn, Greer Garson or Katharine Hepburn? Purely as actress, Ball. If the criteria is strictly film work (where Lucy had some success, but certainly not comparable to what she did in TV), I'd probably go with A. Hepburn. 13. Shadowy film noir from the 1940s or splashy colorful musicals from the 1950s? On the whole, the latter, although in the wrong hands (e.g., MGM aside from the Freed unit), such musicals could look too overgrown for their own good. I'll leave this to the calligraphers. Count me in! I'll be doing it soon, love the questions. but some are tough, you're too mean! Anyway, it is original, nicely done. can I resize the banner to fit my sidebar? I'd have to cut lucy just so the words would be readable, though on the post I'll include it all of course! Great idea, Rianna! I think I can answer those questions this weekend.. Maybe.. :") Enjoyed your answers very much - and have to think a bit about my answers.. Have a great day!! Golden boy. Bill Holden is really young and cute in this movie. And Barbara Stanwyck, as always, is amazing. I haven't really seen many of her films, so I'll have to go with Ann from Mr. and Mrs. Smith, one of the few of hers I watched. Robert Redford and Paul Newman. I also like Jerry Lewis and Dean Martin. I'll have to go with Grace Kelly as well. I've just realized that I don't have that many favorite actresses who happen to be blonde. I don't know if it's because I'm a brunette myself, but I like dark hair better. Having said that, I adore Grace and I think she had one of the best smiles I have ever seen. Baby face (1933). It's really fun to watch Barbara Stanwyck as she sleeps her way to the top. Warner Bros. Some of my favorite actors worked there (including Natalie Wood and Barbara Stanwyck, I believe) and a lot of my favorite movies were made there. And my favorite director, Elia Kazan, worked there as well. Natalie Wood and Robert Redford. They only made two movies together and then she made a cameo appearance in one of his movies, but I think they were the most gorgeous couple. Their children would have been extremely good looking. Mr. and Mrs. T.V. Show. This one was really funny. Natalie Wood (she's my favorite actress). I really like James Garner's signature. Yay, inspiration! I'll try tackling this for my own blog hopefully tonight. Great stuff! I love this survey! What a fun idea. I'll add the logo to my sidebar with a link to your post. Your blog music is so beautiful I could stay here all day, but guess I'll go so others can get in. VP: Thank you for participating, I very much enjoyed reading your answers! Carole had a lot of influence on Lucy indeed, she was a woman Lucy really admired. And I love that photo of Carole as a ten year old, she was adorable! Maria: Yep, a lot of them are pretty tough (Laughs evilly)! Lol. Oh yeah, feel free to resize the banner as you wish, I can't wait to see your answers! Dani: I loved your answers! I agree with you, what gorgeous children Natalie and Robert Redford would have made! I love that baby photo of Natalie. It's from a LIFE photoshoot, isn't it? I have many similar photos on my computer. I will participate and let you know! GREAT POST! ps I LOVE LUCILLE BALL TOO! I have a huge collection of her movies, TV shows, pictures, books and scrapbooks! Glad you liked the answers. And yes, I believe the photo is from a Life shoot. I will add my post after Feb. 15th. I had fun with your survey. I particularly like the way you phrased the "which studio" question by comparing it to the sorting hat. A magazine poll placed me in Hufflepuff. The rest of my family is in Gryffindor and teases me incessantly. Here are my responses. This was a whole lot of fun! I'm so sorry I couldn't answer some of those questions, I'll be sure do to so when I can have a proper answer! You have a great blog! So happy to have found it. Hard to choose. Probably, Lucy in Italy with stomping of the grapes, although the Bill Holden episode is good. This was fun - and I hope you'll do this again next year..
Hey, Rianna. Finally got around to posting my answers. This was fun! Hey, thanks for stopping by. Nice responses. I agree with you on a lot of them! I found this wonderful survey through Rachel at Girl with the White Parasol. I too am a great fan of Godfrey, though my favorite quote comes from Mrs. Bullock: He's the first thing she's shown any enthusiasm for since her pomeranian died last summer. The question I had the hardest time with was #12 because (except for Garson), I am a fan of each one. Hope you'll come by to see my answers, and to see how your banner looks on my blog. Tracy, please get in touch with me so I can find a way to read your blog. Thank you in advance. "The Whale Who Sang at The Met" & "Dumbo". Biggest disney tearjerkers. Way too many great films to have a single favorite. "The Old Maid" came first to mind. "Twentieth Century". The best of any screwball comedy, one of the best comedies ever. I am indifferent to most screwball comedies. Barbara Stanwyck & Robert Taylor. 5. Favorite pair of best friends? James Cagney and Pat OBrien. I read somewhere that Gene Fowler, Albert Dekker and John Barrymore were good friends and drinking buddies. Might have been some interesting conversations before they got really blotto. Ronald Colman and Warren William. Ann Harding - she was a natural blonde too! I have no talents like that a studio would want. Jack Carson & Jane Wyman. They projected such cheerful lust. NONE. I despise I Love Lucy. Not really interested in autographs so I'll go with a personal item. I'd post my photo but don't have a scanner. I once wrote Preiss a fan letter (in German) and he wrote back and sent a photo. He was 90 years old. He was a very popular actor in Europe and apparently was very generous with autographed photos. Film fans say no one wore a Wehrmacht uniform better than Preiss. (Well maybe Maximilian Schell) He seems to have been the "go to" actor when a movie needed a Wehrmacht officer. Besides that, he was a very good and versatile actor with a marvelous voice. I finally did the survey! Excellent survey. I have got many things by you.